Order an entire slab of your favorite soap and save beaucoups $$$. We even crinkle cut it for you. When ordering a full slab, the only thing that's missing is the packaging. You end up with more dosh in your pocket and help eliminate excess packaging waste. But, we won't make you suffer if your slab is a 'freshie'. If we have it in stock, we include an extra, cured bar of soap to tie you over until the first bar from your slab is ready to use. 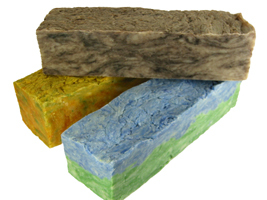 Size: Each slab of handmade soap weighs 3-4 lbs and yields ten (10) 4.5 oz bars of soap. Ingredients: The ingredients vary and may include saponified organic olive, sunflower, coconut, and sustainable harvested palm oils, organic shea butter, fresh goat's milk, essential oils, natural additives for color and love. Visit each soap's description for the full ingredient list. You will receive an ingredient list on each slab of handmade soap. Skin types: All. Safe for people with sensitive skin. Mild & gentle. Benefits: Buying a full slab of soap means that you save at least 25% off the retail price of individually wrapped bars. There is no packaging, so no waste and we all help the environment. All natural, vegetarian, organic, bio-degradable and cruelty free.